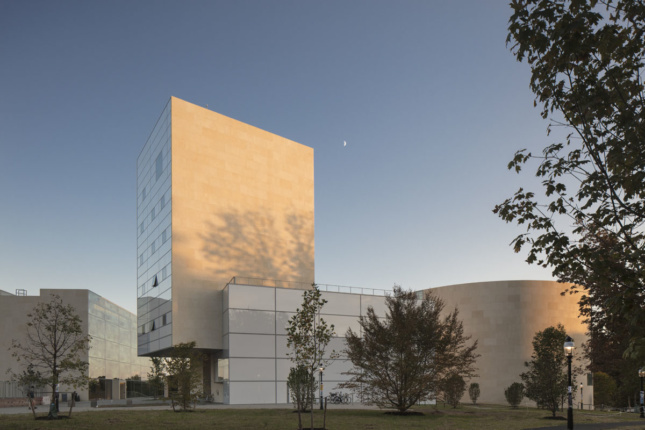 Earlier this month Steven Holl Architects and Princeton University opened the new Lewis Center for the Arts, a three-building complex anchoring the school’s new 22-acre arts and transit neighborhood. 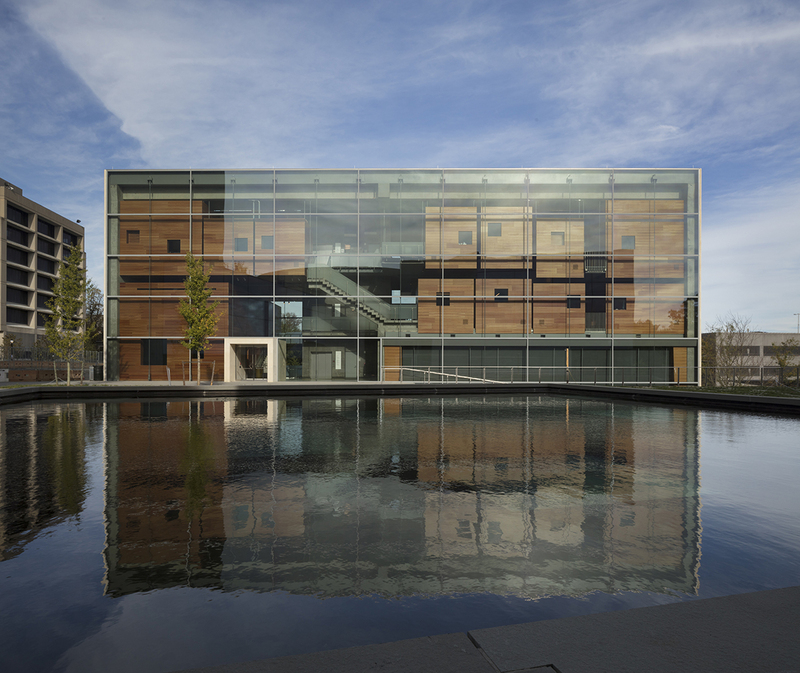 The 145,000-square-foot complex, providing teaching and performance spaces for theater, dance, visual arts and music, includes the Wallace Dance Building and Theater, containing a black box theater and dance performance spaces; the Arts Tower, containing a gallery for the Program in Visual Arts, offices and additional studios; and the new Music Building, containing rehearsal rooms. While the concrete, steel and glass buildings play off each other formally—expanding, tightening, and heightening in seeming progression, all clad in thick, blonde limestone—each takes on a unique identity, reflecting its use and augmenting the complex’s porosity and energy. The interior of the Wallace Theater is finished in perforated black steel, while other theaters in that building are finished in varied materials like foamed aluminum, whitewashed wood, and board formed concrete. All are connected by a “dancing stair,” zig-zagging and twirling between levels, clad in vibrant perforated metal. The Music Building’s individual, wood-chambered practice rooms—floating above the large orchestral rehearsal room—are suspended on steel rods, keeping them acoustically isolated in tension, as if they were musical instruments. This interplay can be clearly seen from outside through glass curtain walls. 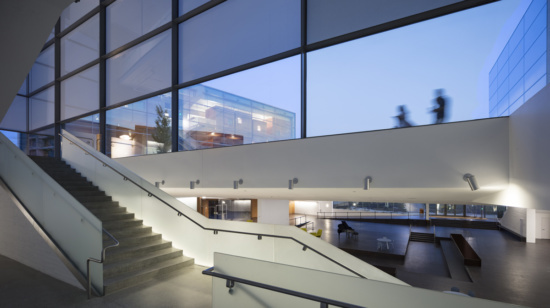 The six-story Arts Tower, cantilevering and seeming to float over its small entryway, references the proportions and massing of the school’s nearby Blair Arch, a famed, vital access point on campus. All three buildings are connected via the Forum, an 8,000 square-foot underground gathering space serving each facility. Above this is an outdoor plaza fitted with stone benches and bluestone pavers and a reflecting pool installed with skylights that filter what Holl describes as “liquid light dancing on the floor” down to the Forum. The complex was made possible in part through a $101 million gift to the University in 2006 by the late Peter B. Lewis, a former Princeton alumnus and university trustee. The arts and transit neighborhood — an ambitious effort to create an engaged gateway on the southern edge of the school’s campus— was designed by Beyer Blinder Belle Architects and Michael Van Valkenburgh. The area also contains a striking new transit hall, a rail station, and various eateries, including the most modern-looking Wawa in existence. Over 450 trees have been planted on the new grounds, 21 of which are on the Lewis Arts Center site.